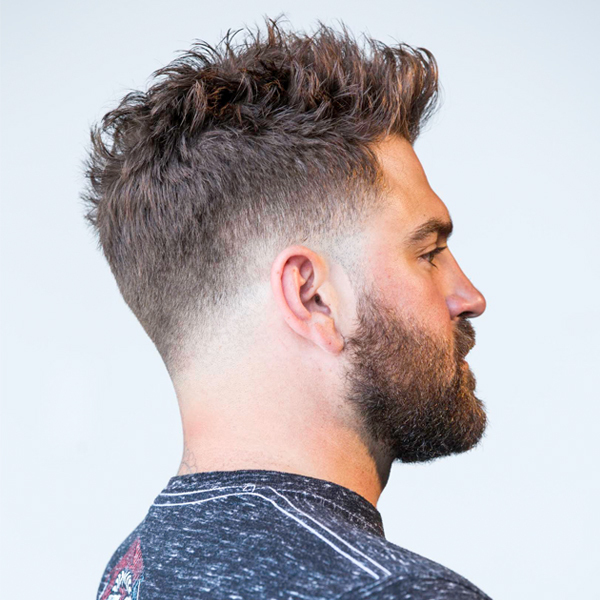 Male clients can be your most loyal and frequent customers—as long as you deliver a detailed cut and custom experience. Floyd’s 99 Barbershop Technical Director Patrick Butler and National Educator Megan Duran went live on BTC’s Facebook to teach our members how to create a texturized low fade men’s haircut, dishing out tips and techniques to start using behind the chair. To create texture at the recession, use a feather razor as your tool because it has a standardized set of teeth for a guard. Take the front hairline out and start with the section directly behind it. Take the hair in finger-wide sections, parallel to the parting and start mid-strand to work your way through to the ends. Keep a slight angle to the razor, so you’re able to glide through the hair. This builds support pieces and breaks the hair up for a disheveled, broken top. Use a feather razor to take out weight in the parietal ridge. Lift the comb from underneath to work your way up and it will grab the hair so it’s suspended in the air, then work the razor across the comb. The comb creates tension that allows you to hold the hair in place, so the blade can glide across to blend and remove built-up weight. Focus on the ends and don’t let the razor close to the scalp. It’s important to blend the side hairline into the beard. Take the comb vertically and work the comb (without a guard) over it, bringing the hair out slightly and working on tapering it in for a clean transition and a detailed, polished look.